One of the new rogues in Kerkerkruip 10 will be Automatos. He is a giant made of steel by the priests of Nomos, and like that god he is committed to law and order. But Automatos takes his lawfulness a bit too far, into the realm of rigity. Instead of using the normal artificial intelligence routines of Kerkerkruip to decide what action is the best, Automatos follows a short predetermined action sequence. For instance, he might concentrate, dodge, attack, block, concentrate, and attack… and then start again at the beginning. This sequence is adhered to very strictly. Automatos will dodge even if nobody is attacking him, for instance; or will counter your attack with an attack of his own, if this is so scripted. Without his rigidity, Automatos might be the most fearsome of all level 4 foes. He is tougher and deals more damage than his counterparts. But the rigidity is there, and once the player has found out which script he is following — the exact sequence will vary — she can take advantage of his predictability. Well-used brains will always defeat tons of mindless steel, right? Right? To make things more interesting, Automatos will lose some of the parts of his cognitive machinery whenever he is struck by a particularly damaging blow. In practice, this means that one ore more actions will fall out of his sequence. So it is possible to have a damaged Automatos who attacks every turn; or, more pathetically, one who never attacks but just dodges and concentrates. Only a hard-hearted fiend like the player character could even contemplate killing such a helpless being. The reaction and flow system of Kerkerkruip 9, while certainly better than the old one, wasn’t working exactly as we had hopen. Dodging was almost always better than parrying, because defensive flow was generally better than offensive flow; rolling was rarely used; and blocking, while useful, was also somewhat hard to conceptualise. For Kerkerkruip 10, we have simplified the reaction and flow system, and so far I like what I see. In the new system, rolling is gone. Dodging and parrying both add one flow, but dodging now transforms all your flow into defensive flow, while parrying transforms it all into offensive flow. Furthermore, any attack you make, whether successful or not, removes all your flow. Blocking gives no flow at all, but gives you a better defense than either of the other two reactions. As a result of these changes, dodging is now generally better than parrying if you will be attacked again before your next attack; and parrying is generally better than dodging if you will attack before being attacked again. This means that choosing the right reaction is a matter of predicting your own strategy and the behaviour of your enemies. And of course, the exact circumstances also play a role, since your weapon, the opponent’s weapon, and features like the bridge of doom can make either of the two options more or less attractive. Blocking now is the action you should use when you really don’t want to be hit — you sacrifice additional flow for having a better defense right now. That could be worth it if you are concentrated or low on health. The new system is simpler and more elegant, and it also seems to deliver more satisfying tactical choices. We need to do more testing, but I suspect we’ll be tweaking this version rather than going back to the old one. But for the general player, news about features that show up in play is perhaps more interesting. So let me tell you about a new item I added to the game today: the epic armour known as the armour of thorns. Or rather, it is known as that when you first find it. The armour of thorns is a blood magic item, and for 12, 18 and 24 blood it can be upgraded to the armour of nails, the armour of spikes and the armour of spears. At each level, the armour doesn’t so much help to defend you, but harms anyone who damages you in melee combat. The armour of thorns deals 1 damage to the attacker, and this increases to 2, 3 and 4 as the thorns grow into nails, spikes and spears. Obviously, that is quite powerful even at low levels. Dealing 6 to 8 damage is respectable for most monsters, and getting 2 or 3 damage in return makes your attacks between 25% and 50% less effective (in terms of how much it changes the health difference between the two parties). Most items need to see some testing in play, and this one is no exception. I am particularly concerned that the blood cost might be too high, so that might well get lowered. It will depend on how good the armour of thorns is by itself. But, some good news for the player: there is a 19% chance that this item starts out as the armour of nails, and a 1% chance that it starts out as the armour of spikes. That would certainly be a great find in the dungeon. Of course, I’d love to tell you about all the cool things we’re making for Kerkerkruip 10. But the truth is that development had been very slow in the past few months, due to technical difficulties. Shortly after Kerkerkruip 9 was released, the Inform 7 team released a massive update of that programming language, which is the language that Kerkerkruip is written in. There were some very good reasons for us to embrace this update, so we committed ourselves to it even though the new Inform 7 version was not backwards compatible with all old code. The update process has been hard. It took us quite a while to get Kerkerkruip to compile again; and we now have it compiling, but the game crashes on the window drawing code as soon as you start it. Obviously, we’re working on fixing this, but it has been hard to continue development in the meantime! Don’t worry, though. There are some good plans for Kerkerkruip 10, and we’ll be full of new creative energy once development gets up to speed again. The Kerkerkruip team is happy to announce the release of Kerkerkruip 9, by far the most extensive update of the game ever made. Kerkerkruip is a short-form roguelike in the interactive fiction medium, featuring meaningful tactical and strategic depth, innovative game play, zero grinding, and a sword & sorcery setting that does not rehash tired clichés. Original theme music for the main menu, composed and produced by Wade Clarke. An entirely reworked reaction system allows you to dodge, block, parry and roll away from incoming attacks. Successful reactions increase your offensive or defensive flow, adding a new layer of tactical depth to combat. An entirely reworked religion system allows you to sacrifice absorbed powers to the gods. Worshipping gods grants lasting benefits, including divine interventions on your behalf; but losing absorbed powers makes you weaker in the short term. Religion thus becomes an important aspect of the player’s overall strategy. Grenades can now be thrown into adjacent rooms, opening up new tactical options. However, your enemies may sometimes manage to throw them back to you! A powerful new grenade is the Morphean grenade, which puts people to sleep. If you become its victim, you’ll find yourself drawn into one of several dream sequences: weird and dangerous adventures that have an effect on the real world. The hiding system has been streamlined, boosted and made far more transparent. Stealth has now become a viable option. The player now starts out with one of several starting kits, necessitating different approaches to the dungeon. New content includes the angel of compassion, a radiant being that loses its lustre as people die around it; Israfel, a terrible angel that can split into two smaller beings for increased combat effectiveness before reuniting to heal; and the Arena of the Gods, where you can defend your god’s honour against other divine champions. A new Menu implementation which is both screen reader friendly and hyperlink enabled. We are now also offering stand-alone installers for specific operating systems. While it’s still possible to download the game file and run it in your favourite Glulx interpreter, there are also installers for Windows and Debian/Ubuntu. We will be supporting OS X in the near future. Go to the downloads page immediately! Kerkerkruip is presented to you by the Kerkerkruip team: Victor Gijsbers, Mike Ciul, Dannii Willis, Erik Temple and Remko van der Pluijm. We hope you enjoy the new version. If you’ve got any comments, or if you’d like to contribute to this free software project, please go the website for details and contact us! I’m very pleased to present a play report by eu, player of and occasional contributor to Kerkerkruip. Enjoy! The past few weeks I’ve been taking Kerkerkruip’s billing as a “coffee-break roguelike” to heart and dungeon diving over lunch. Victor asked me if I would share one of my play reports from the upcoming release, which is nearing the end of its beta phase. In this particular session I was coming in at the “apprentice” level, the easiest that Kerkerkruip’s adaptive difficulty will assign a player who’s defeated the big bad, Malygris. The difficulty names go at least ten levels higher, though I’m usually evenly matched at the next notch up, “adept”. Still, I don’t mind playing as an apprentice on occasion since that gives me a little room for cinematic recklessness. As in prior versions, the game started out with my character’s drunken boasting getting the better of them, landing me in a ruby-lined hall deep underground. But unlike in prior versions, I wasn’t toting that trusty gilded rapier—it was a Yahvinnean dagger at my side, and there was a scroll of shadows stashed in one of my pockets. Non-standard starting kits like this might be my favorite addition in version 9, as, even before the first move, they encourage significant variation in strategy. That, and it’s somehow particularly satisfying to see Chekhov’s gun go off when the author has left that to your own mettle. Case in point regarding strategy, my usual policy is to scout as much of the dungeon as I can before choosing a first target. But when I stumbled on a jumping bomb made of flesh, for which a dagger is an excellent choice, I couldn’t resist. I soon had it drained and deflated. That gave me a second level ability and the associated stat boosts. Some voracious sounds alerted me to a nearby giant armadillo, and, conveniently, a dagger is also useful for nailing weak points in armadillo armor. Its death added a first level skill and more boosts to the mix. At that point I felt ready to take on the level 4 monster. A tentacle of Tooloo (merely level 3) turned up first in my search, and I decided to save it for later. Nonetheless, it was guarding a Morphean grenade, another version 9 addition and a tempting prize, so I tried my hand at burglary. Anyone who’s faced a Toolooean appendage before knows how risky this was; they’re very good at detaining adventurers who hang around too long. But my luck held. Further exploration covered all but an exit leading to the Angel of Compassion (level 2) on a Bridge of Doom. The angel is also new, and poses an unwelcome dilemma when encountered like this. It’s sympathetic to other beings in the dungeon, and its sorrow as they perish enfeebles it. Had I killed it immediately, I could have collected its powers in their only partly diminished state, but I would have lost everything of equal or lesser level from the shock of absorption, i.e., every special ability I already had. Save the angel for later though, and the powers might fully wither. After a bit of hemming and hawing, I concluded that I didn’t want to dispatch it just yet. Instead, I turned again to my starting kit. Thinking that the level 4 would be on the other side of the bridge, I read my scroll, which let me blend into the shadows. Then, for some reason, a bout of prudence struck me. I knew that the scroll would get me past the angel, but walking the bridge like that would also up the tension. If I let it get too high, I might give myself away at the other end. So I threw the precious Morphean (from a safe distance, since that’s now possible in version 9) and put the angel to sleep. And, of course, all I found on the other side were uninhabited ruins; I had spent my grenade for naught. Still, as luck would have it, the ruins held a teleportation grenade, a periapt of prophecy, and an adamantine shield; I donned the latter two and crept south to find the druidess Bodmall. One pack of ment (the game’s combat drug) while hidden activated the predictive powers of my periapt, which, in combination with the armadillo’s scales taking up my defense, let me stage a formidable assault. But the ment ran out, and withdrawal kicked in right after Bodmall reached 2 health, and only by retreating to recharge my scales could I concentrate enough for a finishing blow. Because my maximum health was down, I ran past the (no longer sleeping) angel to collect the tentacle, who couldn’t get by both Bodmall’s brambles spell and my shield. The despairing angel fell easily after that. Then, in walking back, I realized that Bodmall’s room was a grenade-manufacturing lab, so I used several unidentified scrolls I had picked up on the way as raw materials. The results were three: another Morphean grenade, a frag, and a flashbang that immediately blew up in my face. Thankfully, I wasn’t in combat and could just wait for the afterimages to disappear. 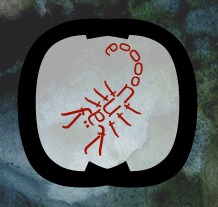 At another guess, I threw the frag and the Morphean into the adjacent room, where I figured Malygris would be. This time my hunch was correct, and I caught him dozing among the shrapnel. Trying to recreate my technique against Bodmall, I snorted a second pack of ment, but I hit maximum concentration and had brambles summoned without ever seeing a favorable periapt read-out. The tension had climbed high enough that I attacked anyway. That got his attention, but I had hoped to follow up with a second blow. Unfortunately for me, we were in the Hall of Mirrors, and I had put all my points into the body statistic, not the mind statistic I needed to figure out which of the Malygrises darting around me wasn’t a reflection. So I called the angel’s sorrow into the room to buy time for a little concentration; grieving, Malygris could only slash at me halfheartedly. The concentration just did the job, and a clonk on his head diffused the mounting tension about who would land a hit first. In the meantime, the brambles I had planted sprouted hidden fruit, which I commanded them to launch. Had this gambit worked out, the fruit would have imparted their concealment to me. Malygris was too perceptive though. Between the spent turn and my next attack not disrupting his mental preparations, he was able to get to maximum concentration and come after me. It ended with me throwing the teleportation grenade knowing that a teleportation beacon was active in the portal room. Him disoriented, and his concentration broken, I hammered on Malygris with the druidess’s staff. All he could do was desperately try to teleport away. I really recommend trying this thing if you haven’t. It pushes in interesting ways on the boundaries of what IF normally does, by having large elements of randomness and systematic play. It is one of the few IF games to make a serious shot at interesting combat that is not puzzle-based, and it shows off UI effects that most Glulx games never attempt. It also yields some surprisingly entertaining moments that capitalize on the juxtaposition of procedurally generated situations with narrative text — for instance, I was being attacked by four enemies and thought my goose was probably cooked, but then I sprouted four tentacles from my torso, my enemies went mad and started licking their own weapons, and I was able to clean up. Emily Short also mentioned Kerkerkruip in a list that shows of the variety of recent interactive fiction. Kerkerkruip is precisely the kind of game that needs to have a wiki. Whether you want to see a list of all the scrolls, review how Isra and Fell work together, or check our strategies for using the dagger of double strike, a wiki could be an indispensable source of information. And having one is common for roguelikes; I myself am an avid user of the Brogue wiki, the Binding of Isaac wiki, and especially the Crawl wiki. Well, Kerkerkruip now has a wiki too! I’m not perfectly happy with Wikia, since the number of ads is quite distracting. But it is certainly functional. At the moment, the wiki is still quite empty. I added a few weapons, but we’ve maybe got 1% of all the information we need. So if you feel up to it, go and contribute! You might want to get your information from the source code. It’s Inform 7 source, so don’t worry. Since version 8, Kerkerkruip has included a kind of trophy gallery that you can check out if you hang around on the title screen for a few seconds instead of immediately firing up a new game. The gallery starts out empty, of course, but each time you kill a new enemy–at least, one that has a soul that you can steal–a card depicting that enemy is added to the gallery. The card also includes a couple of statistics about your long-term relationship with this enemy, namely how many games have gone by in which you’ve killed it, and how many times it has killed you. The cards are illustrated using what I call typographic collage (other examples here, here, and here). Version 8 shipped with art for seven of the game’s enemies: the ravenous armadillo, the chain golem, the swarm of daggers, the mindslug, the adventurer Miranda, the reaper, and the giant tentacle. Version 9 will add three more. I’ve discussed two of them elsewhere, so this post will focus on the most recently completed, the Fanatics of Aite. These fanatics serve Aite, Kerkerkruip’s goddess of cruelty, bloodlust, war, and ruin. As their appellation implies, they are a trio of zealous cultists. They also embody sacred personages: the Defender is a heavily armored blunt instrument of his god, the Tormentor deals excruciating pain from a sacral staff, and the Healer supports them both with curative abilities. I struggled for a while with how to depict three characters on one card (there isn’t much space! ), but as I thought about the way that the cultists subsume themselves into preexisting religious roles, I decided that the best way to convey the nature of these characters was to depict a tableau of sacred objects. The Defender, after all, is just a man until he takes up Aite’s shield, the Tormentor only a woman until she lashes out with the staff of pain. The card lays out these emblems, along with the Holy Sword of the Healer, beneath Aite’s war mask. Note: I cheated a bit here. In Kerkerkruip, the Defender doesn’t actually carry a shield. He is instead armed with a special sword whose main property is that it is essentially stainless steel. I thought the shield was better visually and also as an expression of the Defender’s role, so I just went with that. Purists are asked to sputter silently in a corner. The background texture is by deviantArt user cloaks, and is I think very evocative of the interior of a dark and sacred grotto. The font used is Gafata, and while it has some nice shapes the lack of character of some of its glyphs gave me some tough moments. In the end, though, I think it turned out to provide good character for the images. Read about the minotaur card on the Glimmr blog. 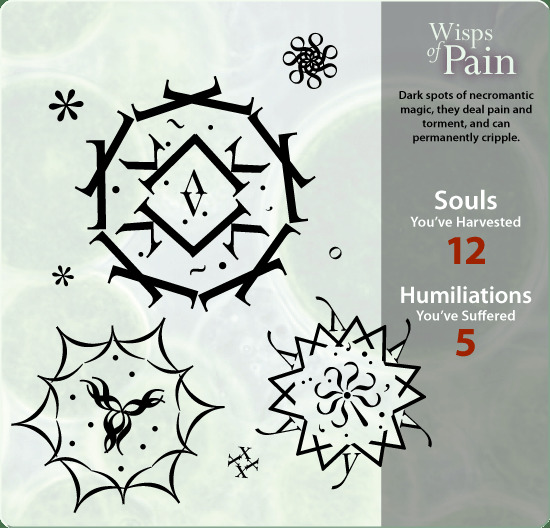 Read about the wisps of pain card on the Glimmr blog.